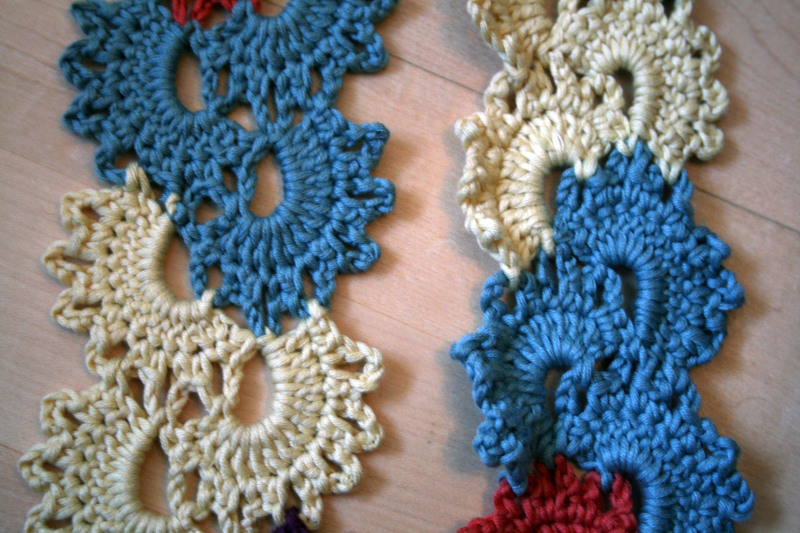 Blocking – Does it Really Make a Difference? Well if this is a question you have asked yourself before take a look at this. This is a scarf I started whilst sipping afternoon tea at the Old Deanery in Ripon where we spent a couple of days chilling recently. I thought this would be a good example to show the difference blocking makes to a project so I have blocked half and left the other half it it’s just finished state so we will be able to make a direct comparison. 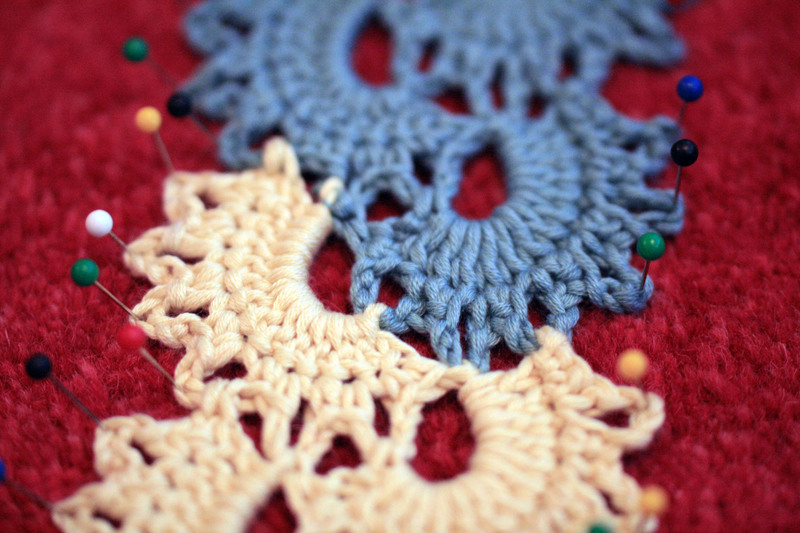 I have to admit the pinning part of blocking this took ages and the truth is that I ran out of pins at the halfway mark so had no choice than to do it in two stages. 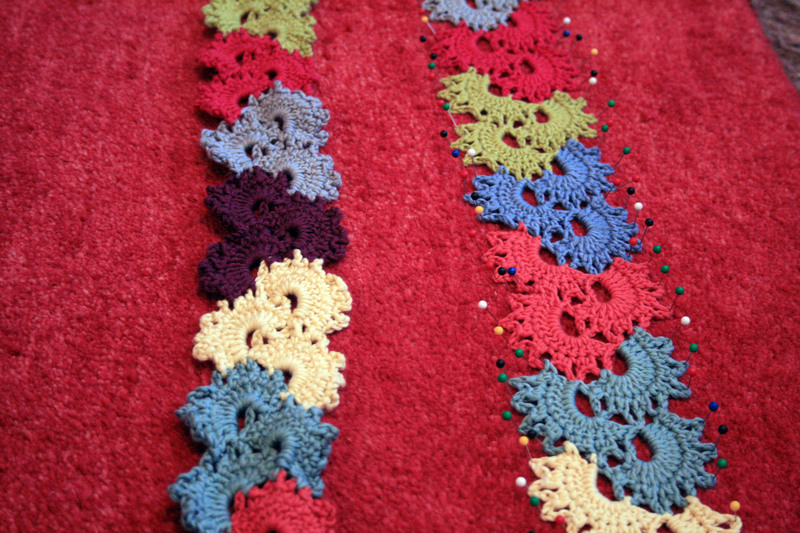 It was having to block all the little picot edging that used so many pins. You can see the difference already but first I will need to spray it with water and leave it in place to dry so it can take on it’s new shape. I have tried to take a photo to show how different it looks you can see very clearly from this image how curly the edges are without blocking. I loved this pattern, the lacy, delicate pattern looked so intricate but yet was actually quite simple to do. But now it is blocked I think it looks even more lovely. I had better get to work pinning out this second half before it will be fit for wearing! And then I am going to make a Beanie Hat to go with it. Reblogged this on Crafty Projects I Like. Great to hear from you and thanks for reflagging this post. Ok this is confirmation that I’m going to have to figure something out to block my granny square blanket… I have no large foam board nor do I have pins… or maybe I’ll just wait till I get home to Australia to do it haha! I sometimes even resort to doing in on the rug in my workroom if it is something large. I think the most important thing is to block it! So pleased you liked the demo, be prepared for it is a pain to do and patience is required (that’s the hardest part) but it really does make a difference. As much as I hate blocking, it really does make a huge difference. Especially with your delicate pattern! Yes, thanks, it was worth the effort, or at least it will be once I do the other half! The lace is beautiful! Is there a pattern we can see? Yes, I am so sorry I forgot to put the pattern reference in but I have made a hat to go with the scarf so I will add the pattern to that post. I love the changing colours, such a pretty scarf. The blocking really accentuates the pretty lacy nature of the pattern, doesn’t it? I think so too, I have to be honest though and admit that I still haven’t blocked the other half. We were away last weekend but I will make a pledge now to do it this weekend for sure. 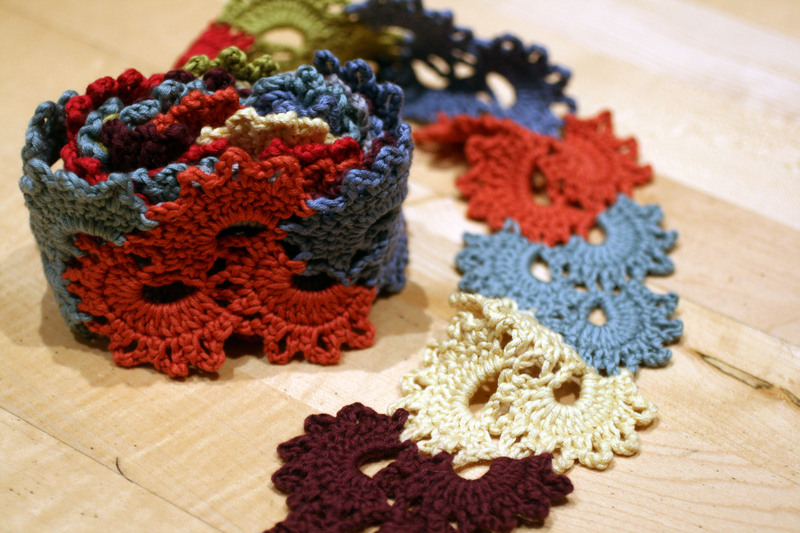 I never feel like my projects are truly finished until they have been blocked! With that being said, I don’t always have the patience to do it as well as I probably should. Well at least you do do it so you are showing willing. Yes, it sure does make a difference. Thank you! Your most welcome. You give the most informative information. Yes, thank you. Now I truly see what a difference blocking makes. Blocking takes time and patience but is worth it in the end. beautiful scarf, blocking really made it pop. Watch this space, I am just writing the hat post and hope to get it posted tonight. It doesn’t actually match the scarf in terms of the pattern as I couldn’t quite make that work but the colours match so I think it will look ok.
Beautiful scarf, by the way. Thank you, I knew blocking helped enhance the appearance of a project but I think this particular scarf pattern truly benefits from blocking. I totally agree, I treat natural fibres and acrylics in the same way as you describe, I cannot say that I quite understand the science behind it but it does work. 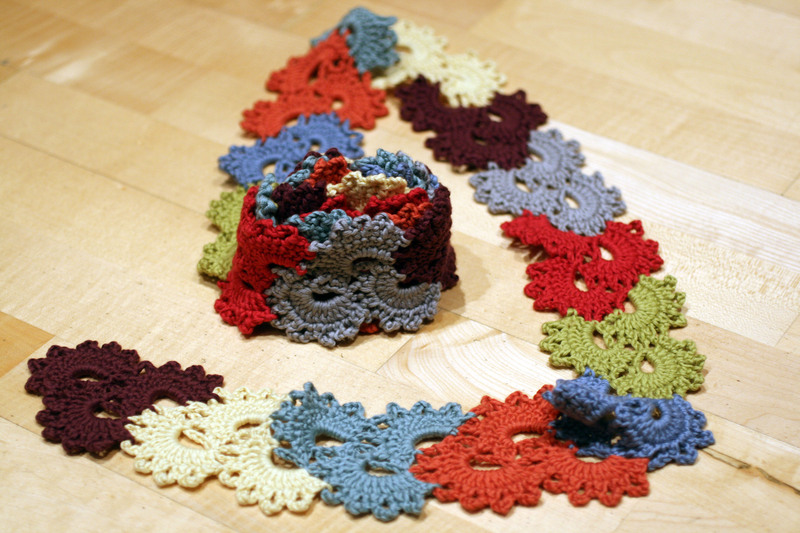 Beautiful scarf (looks too complicated for me) and yes, it needed blocking to show it off properly. Thank you for your comments, I forgot to give details of the pattern so I will post it with the Beanie hat that is almost finished. It’s one of those patterns that looks complicated but is actually quite simple to execute. What a beautiful scarf! AND a great blocking job! Pleased to have done it but oh what patience it has taken! What a great way to look at it. I think you are right, when you have put the time and effort into creating something it is good to see it properly finished and looking it’s best. Great to think I may have converted you! 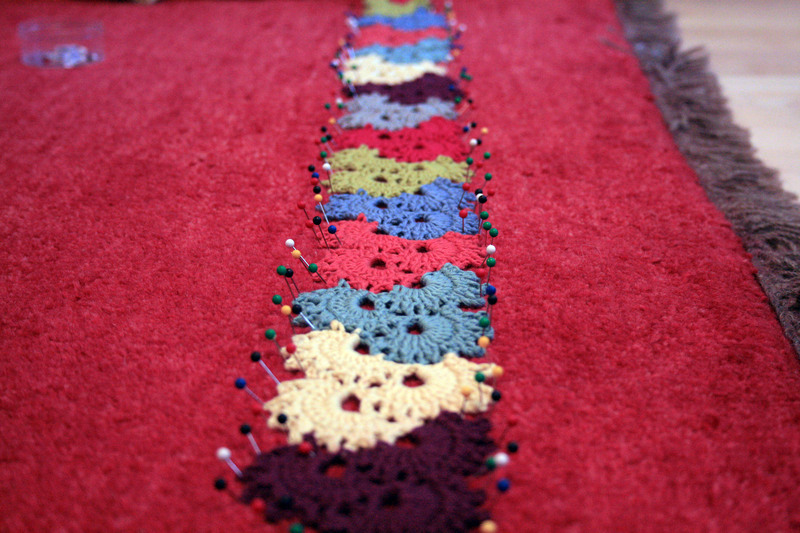 With acrylic yarn I usually use a steam iron, just hover over the work once you have it laid out in the shape you want. Hope it goes well, please let me know. Thank you, I am loving your Christmas sweater too. I knew it mattered, but you did a great demo! truthfully, I don’t block everything, but anything lacey, I do. And anything that is rolling when I don’t want it to, I do. But hats, socks, things like that, I just don’t. I’m lazy. I agree that some things you can probably get away without blocking. It is a bit of a pain to do, I think it is because you have to be patient and you can’t do anything , just wait and as crafters we like our hands to be busy. Oh I know it is such a bore but worth it in the end. 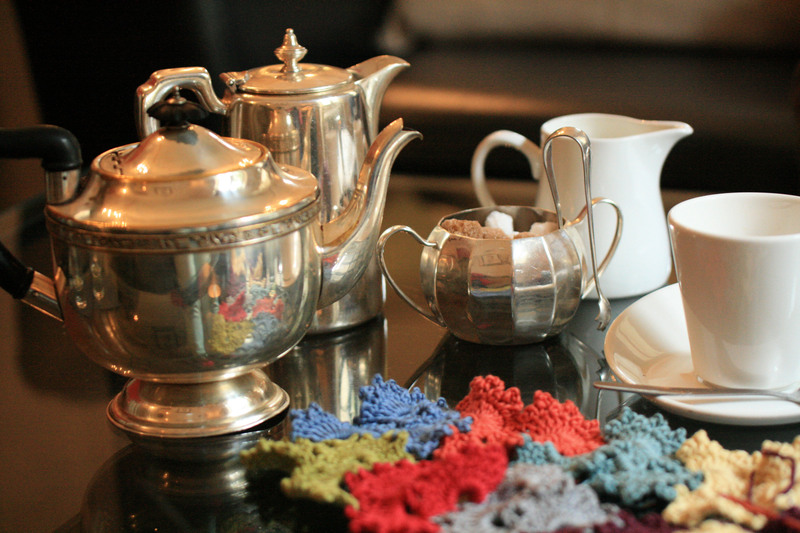 Thanks for sharing Geraldine – the scarf is beautiful!! 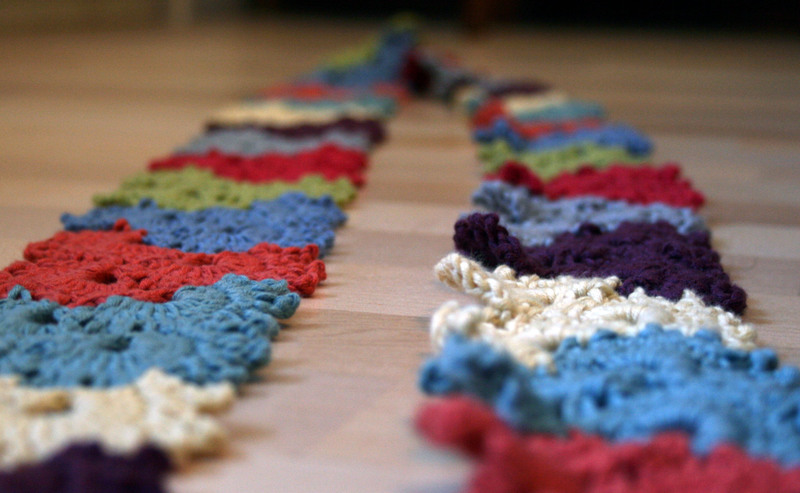 A beautiful scarf either way but I can really see the difference that blocking makes!! I think it is worth the effort on this project. Yes that’s about it, it’s the waiting that gets to me, having to resist removing the pins too soon. Thank you, I am surfing for a pattern as we speak. It really does make a difference, worth the painstaking effort of pinning. I will be keeping an eye on you ready to drop a quick reminder if required, ha, ha!